Scott D. Swanson is a registered patent attorney who co-founded the Firm in 2015. 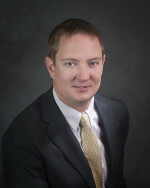 Scott focuses on patent searching and patent prosecution, freedom to operate opinions, trademark searching, Federal trademark application filings, and intellectual property litigation including roles as both lead counsel and as local counsel for out of state attorneys representing clients in Idaho and Utah courts. Scott has been registered to practice before the U.S. Patent and Trademark Office since March of 2007 and is licensed in Idaho and Utah. Scott is an Idaho native, born and raised in Pocatello, Idaho, earning a Bachelor’s degree in Biochemistry from the University of Idaho in Moscow, Idaho. Scott attended Ave Maria School of Law in Ann Arbor, Michigan, on a full tuition scholarship. In addition to his professional interests, Scott enjoys spending time outdoors flyfishing, mountain biking, and downhill skiing. Scott is an avid fly fisherman and fly tier who can often be seen with a fly rod on Idaho’s lakes and rivers throughout the year. Scott also is an avid hunter, both archery and firearm, who enjoys pursuing upland birds, waterfowl and big game, particularly elk, throughout the State of Idaho. Scott’s litigation practice has been multi-jurisdictional in that Scott has represented clients and been admitted, either pro hac vice or formally admitted, in Federal Courts in the District of Idaho, District of Utah, Northern District of California, Northern District of Ohio, District of New Jersey, District of Minnesota, Northern District of Indiana, Central District of Indiana, and the District of Wisconsin. Scott has prosecuted and defended Trademark Trial and Appeal Board proceedings including Trademark Opposition and Cancellation proceedings. Obtained favorable settlement for trademark owner in case of competitor utilizing trademark owner’s trademark as a hashtag in social media. Competitor agreed to change name of company and to refrain from utilizing client’s trademark in social media hashtags. (2015). Presented a CLE on nontraditional trademarks entitled “Shapes, Sounds & Scents: A CLE on Nontraditional Trademarks” on May 20, 2010 to the Idaho State Bar Intellectual Property Division. Idaho State Bar Intellectual Property Section Southern Vice Chairperson, 2015-Present. Idaho State Bar Intellectual Property Section Chair 2010-2011. Idaho State Bar Intellectual Property Section Treasurer 2009-2010. Represented Ave Maria as a member of a two person team in the prestigious Giles Sutherland Rich Memorial Moot Court Competition in Chicago, IL, regarding patent law in 2006.